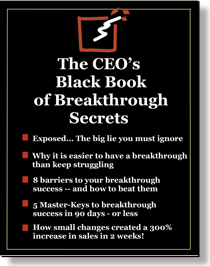 Thanks for requesting The CEO’s Black Book of Breakthrough Secrets. You can access your instant download just by right-clicking on the picture of the report below and “saving as”. You may also be interested in this: I recently did a presentation on creating breakthroughs – you can access the full webinar on the right. No opt-in required. And, click on the “Home” page button above if you want access to more articles and resources. Here’s The Breakthrough CEO. . .